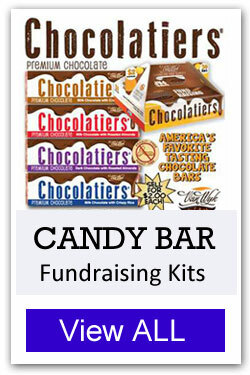 Below are a few Sweet Selections for Fundraising, including Katydids, Candy Bar Kits, Lollipops, and Soft Caramels which can be ordered by the case. 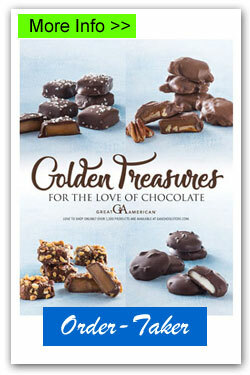 Plus, several order-taker brochures for candy, including Golden Treasures, Katydids, Classic Collection, Caramels, and Yummy Bunnies. 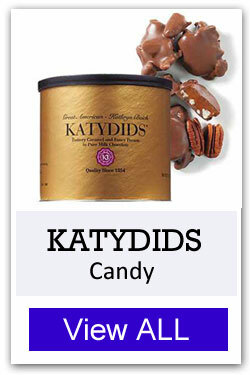 Katydids Candy – is the most popular candy fundraiser. 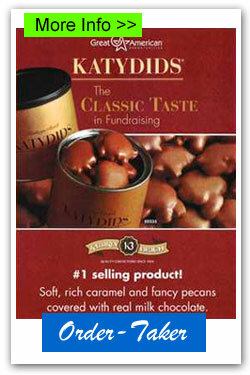 You can buy either the boxes or tins up front and sell to earn your profit, or you can choose to do an Order-Taker fundraiser by requesting the Katydids brochures, take orders, and pay for products after your fundraiser is finished (see below). Chocolate Bar Kits – are also a great seller, especially for sports teams to sell at games and events. There are several choices of brands and types of candy bar kits. Brands include: Kathryn Beich and Van Wyk. You can choose $1 or $2 candy bars, variety packs or straight packs. Each master case holds several candy bar kits. These kits have easy to carry handles to make selling easy. We recommend ordering one kit per participant. 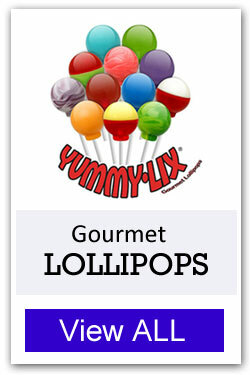 Lollipops – are another fun idea for fundraising for schools, churches, or any club or group. There are many flavor and theme choices, including General, Holiday, and Sports. Soft Caramels – will be a hit for your next fundraiser. Available to order in 6 flavors. Individually wrapped, Made in USA. Also available as an order-taker fundraiser. Katydids Candy – Everyone’s favorite candy in an order-taker brochure! Golden Treasures – A variety of yummy candy choices, including katydids, caramels, and imps. 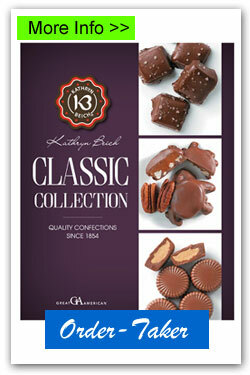 Classic Collection – 8 yummy Kathryn Beich candy choices, one price for each selection. 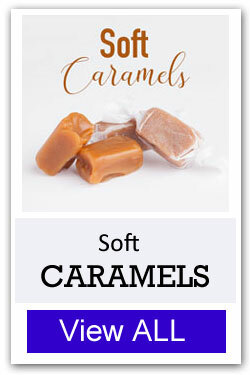 Soft Caramels – These soft, yummy caramels in an order-taker brochure featuring all 6 flavors.